Have a few delicious Halloween party recipes on hand that are easy to make, using fall flavors and Halloween themes that will perfectly suit the event. This helps to simplify planning your Halloween party so you can focus on all of the other elements of the gathering. 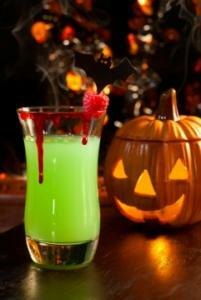 Halloween party recipes can run the gamut from pumpkin cookies to ghostly cupcakes. For those who are looking for something quick and easy to make, cupcakes decorated with orange and black icing or cookies shaped like pumpkins are quick fixes. However, if you want to get a bit more creative, the following Halloween party foods aren't difficult to make, and add variety to your party menu. You'll want to make these right before the party begins so the pastries are light and warm. Slice each pastry into thin strips. Wrap strips around the sausages creating a "mummy" appearance. At one end of the sausage, leave a small opening for the face. Add cloves to the face to create "eyes." Beat the egg slightly, and dip the mummies into the beaten egg. Place mummies on a greased cookie sheet. Bake at 350 degrees F for 12 to 14 minutes. This is a yummy and good-for-you treat that kids love! Choose bananas that are ripe but still firm, and cut each banana in half at its width. Insert a popsicle stick into the bottom of each banana half. Cover each banana with wax paper and freeze until firm. This will take three or four hours. Roll banana in melted white chocolate, or spread chocolate on the banana with a knife. Refreeze the banana until you are ready to serve. This is another great recipe that's very easy to make. To begin, you can either make brownies using a mix or try the following simple brownie recipe. Beat eggs in a large bowl. Add the rest of the ingredients and mix thoroughly. Place in a greased pan, and bake at 350 degrees F for 20 minutes. To give a "ghostly" look to the brownies, cut brownies into squares after they have cooled. Round off one end of each square to create the shape of a ghost. Cover each "ghost" with white fondant. Add chocolate chips for eyes, nose, and mouth. Instead of rounding the edges of square brownies with a knife, you can also cut brownies out using a ghost shaped cookie cutter. Crumble scraps to use in Halloween dirt cake instead of chocolate cookies. Don't forget the drink recipes! Who doesn't love caramel apples? 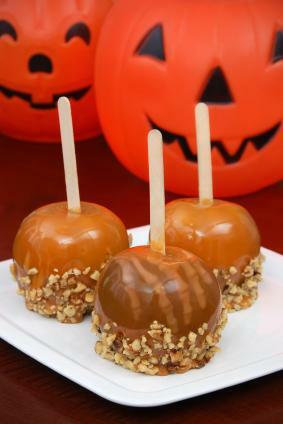 This Halloween recipe adds some spookiness to the traditional caramel apple. Place a popsicle stick into the top of each apple. Mix unwrapped caramels and milk in a microwave-safe bowl, and microwave for 1½ to 2 minutes. Stir the caramel mixture until completely smooth, and let cool. Hold each apple by its stick and roll or dip apple into the melted caramel. Place apples on a greased cookie sheet. Immediately add candy to the apples so it will set into the caramel. To create a "monster," attach gummy worms as hair and chocolate chips or raisins as eyes, ears, and nose into the caramel. Having some fun themed recipes for Halloween makes everyone smile when they see the party food. From simple Halloween cupcakes to more complicated gross recipes for Halloween, your buffet table is sure to be a hit with all your guests. Scrumptious spooky eats and treats are perfect for a Halloween party!